Betting on the National Basketball Association shot up dramatically in, and each year after,1979 when Magic Johnson and Larry Bird were drafted, becoming one of the greatest sports rivalries of all time and pushing the NBA to new heights and into the mainstream sports media. Today, the 30-team league has never been more popular around the world and betting on professional basketball is more popular than ever. When picking an online sportsbook, it’s our goal to make sure you don’t get hit with a technical and aim to provide you with the most trusted sites in the betting industry, so your winning bets are nothin’ but net. Are Online NBA Sportsbooks Legal in the United States? Offshore: Yes. Currently, there are no federal laws in the U.S. that prohibit placing a bet on NBA games at legally licensed, offshore sports betting sites. There are a bunch out there, and the ones we recommend have been reviewed by our staff to ensure each is both legal and safe. Domestic: States have begun the process of legalizing sports betting across the country following the repeal of PASPA, but the legislative process has been slow and many do not allow online sports betting sites offering NBA lines to operate within the state. Bovada is one of the biggest and most reputable names in online sports betting. They used to be called Bodog, but opened up Bovada sportsbook to cater exclusively to their USA players. 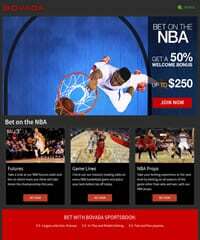 They offer every NBA betting option a player could want also offer a mobile betting platform, live betting options, horse racing, a full online casino and poker room. With all the betting options available at Bovada, there is really no reason to bet anywhere else. They also offer some of the highest parlay payouts in the industry. New depositing players can claim their generous 50% bonus up to $250 on their first deposit. The NBA has 30 professional basketball teams that play in the Eastern and Western Conference. Every NBA team plays an 82-game regular season schedule, and the 8 teams from each conference, 16 teams in total, who finish with the best overall record qualify for the NBA Playoffs with a chance to compete in the NBA Finals. Certain types of bets on the NBA can only be placed once a key event takes place while other bets can only be won once a particular outcome is known. To assist with these bets, here are all the biggest events and important dates for the 2018-19 NBA Season. During an NBA season, betting lines for each individual game receive the bulk of the action, and the two most essential bets to build a bankroll are the point spread and the money line. All examples are courtesy of Bovada. The point spread bet in the NBA is identical to the one found in other sports leagues such as the NFL, where the betting line is used to handicap a favorite and create a perceived equal bet to both sides regardless of talent level. In professional sports, the margin of a point spread is typically much smaller due to the amount of parity within the league, and this remains true when looking at the NBA game lines. In the example, we can see the Nuggets are the home team and the favorite to win against the Lakers. This is indicated by the negative number outside the parenthesis. For a bet to be won on the Nuggets, the team must beat the Lakers by 5 points or more. On the flip side, for a winning Lakers bet, the team must lose by 3 or fewer points to the Nuggets or win the game by any margin. The odds are always located within the parenthesis and indicate the amount of money needed to place a bet and the potential payout. For this example, (-110) means 110 units of money, like $110, needs to be wagered to win 100 units of money, which would be $100. Keep in mind that NBA game betting lines do change, which is dictated by how much money comes in on one of the two sides. The sportsbook will change it in this case as the game gets closer to tipoff but won’t change it once you lock in your bet. A money line bet on an NBA game is much simpler to understand since it is a straight bet solely on which team will win the game. Because of this, and there being no spread involved, the odds are what is affected by the amount of action that comes in one of the two sides. For this example, only the odds are displayed, and as mentioned above, this determines how much money must be wagered on either side and what the payout will be. The Pelicans are the favorite at home, as indicated by the negative number, and a bet on them needs 135 units to win 100 units. For the Celtics, 100 units must be wagered and should they win, as the underdog, you’ll win 115 units. The reason more units need to be wagered on and the payout is lower for the favorite is because they are the team more likely to win and the opposite is true for the underdog, where fewer units must be bet to win a larger amount due to the outcome being less likely to happen. In the early 1900s, several leagues sought to give college graduates a chance to make a living off playing basketball as a profession. The early leagues had a rough time appealing to viewers and often played games in small collegiate basketball arenas, high school gymnasiums, and even ballroom dance halls. There were numerous leagues popping up during this volatile time and owners of major ice hockey arenas in the Northeast would form one league, calling it the Basketball Association of America (BAA), would be founded in New York City on June 6, 1946, and eventually bring professional basketball to millions around the globe. Before doing this, the BAA would merge with the National Basketball League (NBL) on August 3, 1949, adopting the name we all know today and became known as the National Basketball Association (NBA). Top 10 NBA Fun Facts – Did You know? The Boston Celtics have won 17 NBA Championships, the most of any team, but not by a large margin. The Los Angeles Lakers are second with 16 titles. Bill Russell won 11 NBA Championships during his 12 appearances in the finals during his career with the Boston Celtics, more than any other player. In addition, from 1959-66, the Celtics won 8 straight NBA titles, which is still the record for most consecutive titles won in any North American professional sports league. Kareem Abdul-Jabbar is the all-time leader in scoring with 38,387 points scored during his 20-year NBA career. The shortest player, Moggsy Bogues (5’3”), and the tallest player, Manute Bol (7’7”), in NBA history played on the same team during the 1987-88 season for the then-Washington Bullets. When Michael Jordan played college basketball at North Carolina, his team won the 1982 National Championship, and he believed the shorts he played in were lucky. For the rest of his historic career, he wore his North Carolina shorts underneath his NBA shorts and is credited for the longer shorts all players wear today. Shaquille O’Neal made 11,196 shots during his career but made only one 3-point field goal, which came on February 16, 1996. Kobe Bryant was the 13th pick in the 1996 NBA Draft and needed his parents to co-sign his contract due to being under the age of 18 at the time. LeBron James is ambidextrous, meaning he can use both his left and right hand equally well. He always shoots with his right hand and has said he does pretty much everything else in life with his left hand. There has never been a quintuple-double state line recorded for any NBA game in history, which would be at least 10 recorded stat-points (the lowest double figure) in any five categories (points, rebounds, assists, etc. ), but four players have managed to record a quadruple-double during a single game. Oscar Robertson was the only player to average a triple-double for an entire NBA season, his 1961-62 season until Russel Westbrook averaged 31.6 points, 10.7 rebounds, and 10.4 assists per game during his 2016-17 season. Westbrook managed to accomplish this feat again during the 2017-18 season, becoming the first player to average a triple-double for an entire season twice.